Archaeoglobus profundus (Burggraf et al. 1990) is a hyperthermophilic archaeon in the euryarchaeal class Archaeoglobi, which is currently represented by the single family Archaeoglobaceae, containing six validly named species and two strains ascribed to the genus 'Geoglobus' which is taxonomically challenged as the corresponding type species has no validly published name. All members were isolated from marine hydrothermal habitats and are obligate anaerobes. Here we describe the features of the organism, together with the complete genome sequence and annotation. This is the second completed genome sequence of a member of the class Archaeoglobi. The 1,563,423 bp genome with its 1,858 protein-coding and 52 RNA genes is a part of the Genomic Encyclopedia of Bacteria and Archaea project. Strain AV18T (= DSM 5631 = JCM 9629 = NBRC 100127) is the type strain of the species Archaeoglobus profundus [1,2]. It is the second of five species currently ascribed to the genus Archaeoglobus, of which the type species is A. fulgidus, described in 1988 . Strains for all Archaeoglobus species were isolated from marine hydrothermal systems, yet A. fulgidus originates from a shallow marine hydrothermal system at Volcano, Italy  whereas A. profundus was isolated from a deep sea hot vent area (depth: 2000 m) at Guaymas, Mexico . The genome sequence of the type strain from a third species of the Archaeoglobaceae – Ferroglobus placidus  – has been completed very recently (Feb 2010) at the Joint Genome Institute (CP001899). Here we present a summary classification and a set of features for A. profundus strain AV18T, together with the description of the complete genomic sequencing and annotation. Six species with validly published names and two strains ascribed to the not invalidly published genus 'Geoglobus' [5,6] are currently assigned to the Archaeoglobi, all of which were isolated from marine hydrothermal systems ranging from shallow water to deep sea habitats of 4,100 m depth. Five species thereof are accounted to the genus Archaeoglobus: A. profundus, A. fulgidus, A. veneficus , A. infectus  and A. solfaticallidus . Publications about the taxonomy of the Archaeoglobi often mention another species of this genus (“A. lithotrophicus”) isolated from deep oil reservoirs , but no formal species description has been published, therefore this ninth species is excluded from comparisons shown in this work. Based on 16S rRNA gene sequences, the closest related type strain is F. placidus  with 96.5% sequence identity, while the other type strains of the genus Archaeoglobus share 91.9-95.0% sequence identity , with the non validly published ‘Geoglobus’ strains inbetween (94.4%). The nearest related genera are Pyrococci and Thermococci with about 86% sequence identity. Searching the NCBI non-redundant nucleotide database with the 16S rRNA sequence of A. profundus, 73 sequences of at least 90% sequence identity were found. Fifty of these sequences belong to uncultured archaeal phylotypes from environmental samples, all others were identified as belonging to the Archaeoglobaceae. These samples originated from marine hydrothermal systems at the Mid-Atlantic Ridge [12,13] and AJ969472, the East Pacific Rise [14,15], Izu-Bonin Arc , and Southern Mariana Trough (AB293221, AB293225, AB293242, AB293237) in the Western Pacific Ocean, Iheya Basin (Okinawa Trough) in the East China Sea [17,18], the Gulf of California [19,20], a seafloor borehole at Juan de Fuca Ridge in the Pacific Ocean , from high temperature oil reservoirs , and from terrestrial hot springs in Europe , North America [24-26], East Asia (FJ638514, FJ638518-23 FJ638504, FJ638508) and Southeast Asia . These numerous findings (as of January 2010) corroborate and extend the early assumption  that members of the Archaeoglobaceae may be widely distributed across hydrothermal habitats. Figure 1 shows the phylogenetic neighborhood of A. profundus AV18T in a 16S rRNA based maximum likelihood  phylogenetic tree, which is in agreement with earlier inferences of the phylogeny of this taxon [5,6,8,9,31]. Remarkably, A. profundus clusters together with F. placidus, apart from the cluster containing the other three species of the genus Archaeoglobus, indicating polyphyly of the genus and therefore possibly the need for taxonomic emendation, as discussed previously .The sequence of the single 16S rRNA gene copy in the genome of A. profundus AV18T is identical with the previously published 16S rRNA gene sequence derived from DSM 5631 (AJ299219), which contained five ambiguous base calls. Phylogenetic tree highlighting the position of A. profundus AV18T relative to the other type strains within the family. The tree was inferred from 1,334 aligned characters [28,29] of the 16S rRNA gene sequence under the maximum likelihood criterion  and rooted in accordance with a current taxonomy . The branches are scaled in terms of the expected number of substitutions per site. Numbers above branches are support values from 1,000 bootstrap replicates if larger than 60%. Lineages with type strain genome sequencing projects registered in GOLD  are shown in blue, published genomes in bold: Methanococcus aeolicus (CP000743), Methanocaldococcus fervens (CP001696), Methanocaldococcus jannaschii  and A. fulgidus , two of the very first organisms whose genome sequences have been revealed. Cells of A. profundus AV18T are reported as Gram stain-negative, highly irregular cocci, occurring singly or in pairs (Figure 2 and Table 1) . They have dimensions of approximately 0.7-1.3 µm x 1.4-1.9 µm. The organism shows a blue-green fluorescence at 420 nm UV light, indicating the presence of coenzyme F420, and contains a cell envelope composed of subunits covering the membrane, which is visible in thin sections . Motility and flagella were not observed [1,43] in contrast to all other members of this genus, with the exception of A. sulfaticallidus, which was described very recently . Growth of strain AV18T occurs between 65 and 90°C with an optimum at 82°C, at a pH ranging from 4.5 to 7.5 and a concentration of NaCl between 0.9 and 3.6% . A. profundus is mixotrophic under strictly anaerobic conditions  with hydrogen as an essential energy source and sulfate, thiosulfate and sulfite as electron acceptors, producing H2S . All members of the genus Archaeoglobus can utilize hydrogen as electron donor, in addition, A. fulgidus, A. veneficus and A. solfaticallidus can use at least a subset of the organic compounds pyruvate, formate, acetate or lactate [9,43]. Electron acceptors are those of A. profundus (see above) except for A. veneficus and A. infectus) which are incapable of utilizing sulfate [9,43]. Carbon sources can be CO2 (except for A. profundus and A. infectus) or organic compounds [8,9,43]. Due to differences mainly in metabolism, a new genus was introduced for F. placidus : Unlike previously described Archaeoglobales, F. placidus is capable of growing by nitrogen reduction, and oxidation of ferrous iron or sulfide, but unable to reduce sulfate . Besides, it is the only reported case of an archaeon which can anaerobically oxidize aromatic compounds, by reduction of Fe(III) . Other published species of this class are “Geoglobus ahangari”  and the recently reported “G. acetivorans” . The genus “Geoglobus” again separates from the other Archaeoglobaceae by characteristic metabolic features: in cultivation experiments, the sole electron acceptor used by these species is Fe(III) and they are reported to be the first hyperthermophilic organisms exhibiting growth upon anaerobic oxidation of long chain fatty acids [5,6]. In A. profundus, acyclic C40 tetraether, an unknown compound at an Rf in the range of cyclized glycerol-dialkyl-glycerol tetraethers, and a C20:C20 diether constitute the membrane core lipids, whereas C20:C25 diethers are absent, similar to A. fulgidus . 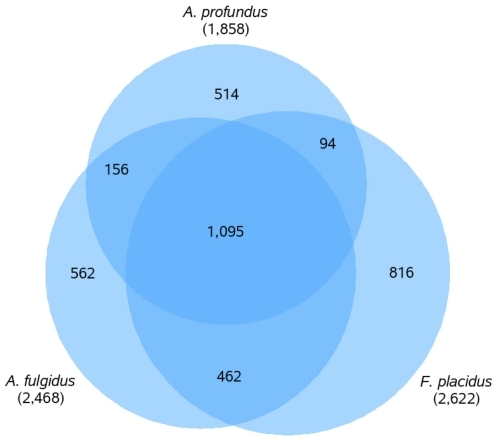 However, A. profundus differs from A. fulgidus in the composition of complex lipids, consisting of two phosphoglycolipids at Rf 0.10 and 0.13, and four glycolipids at Rf 0.40, 0.45, 0.60, 0.65, while the latter contains two phosphoglycolipids at Rf 0.10 and 0.215, one phospholipid at Rf 0.30 and one glycolipid at Rf 0.60 . The cell envelope consists of an S-layer and is rifampicin and streptolydigin resistant . This organism was selected for sequencing on the basis of its phylogenetic position , and is part of the Genomic Encyclopedia of Bacteria and Archaea project . The genome project is deposited in the Genomes OnLine Database  and the complete genome sequence is available in GenBank. Sequencing, finishing and annotation were performed by the DOE Joint Genome Institute (JGI). A summary of the project information is shown in Table 2. A. profundus AV18T, DSM 5631, was grown anaerobically in DSMZ medium 519 (A. profundus medium)  at 85°C. DNA was isolated from 1-1.5 g of cell paste using Masterpure Gram-positive DNA purification kit (Epicentre) with a modified protocol for cell lysis, st/DL according to Wu et al. . The genome of strain AV18T was sequenced using a combination of 454 and Illumina sequencing platforms. All general aspects of library construction and sequencing can be found at Web Site. Pyrosequencing reads were assembled using the Newbler assembler version 2.0.0-PostRelease-10/28/2008 (Roche). Possible misassemblies were corrected with Dupfinisher  or transposon bombing of bridging clones (Epicentre Biotechnologies, Madison, WI). Gaps between contigs were closed by editing in Consed, by custom primer walk or PCR amplification. A total of 26 finishing reads were produced to close gaps, to resolve repetitive regions, and to raise the quality of the finished sequence. Illumina reads were used to improve the final consensus quality using an in-house developed tool (the Polisher, unpublished). The error rate of the completed genome sequence is less than 1 in 100,000. Pyrosequence provided 136× coverage of the genome and the final assembly contains 718,930 454-pyrosequence reads. The 1,563,423 bp genome consists of a 1,560,622 bp chromosome and a 2,801 bp plasmid with an overall G+C content of 42.0% (Table 3 and Figure 3). Of the 1,909 genes predicted, 1,858 are protein-coding genes, and 52 RNAs; 35 pseudogenes were also identified. The majority of the protein-coding genes (60.0%) were assigned a putative function while the remaining ones were annotated as hypothetical proteins. The distribution of genes into COGs functional categories is presented in Table 4. 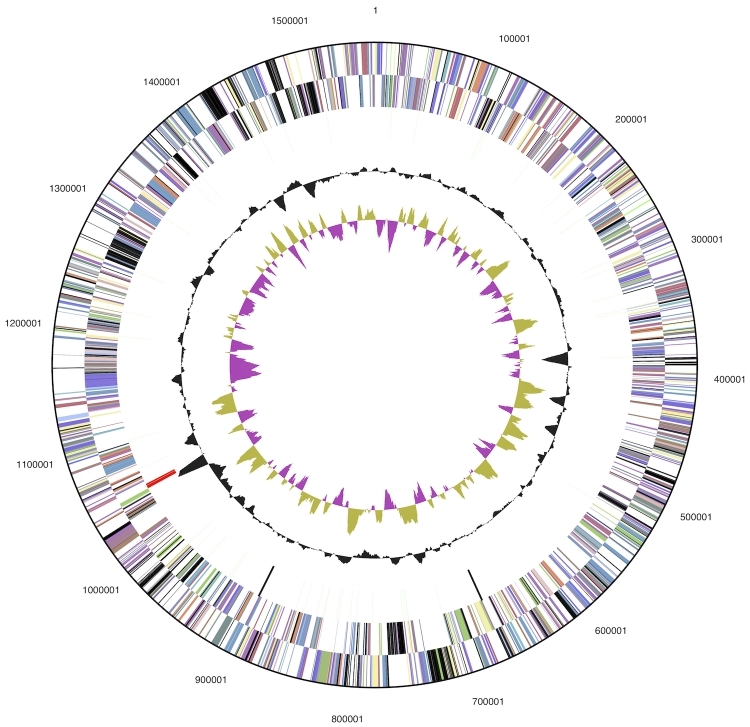 Graphical circular map of the genome (without the 2.8 kbp plasmid). From outside to the center: Genes on forward strand (color by COG categories), Genes on reverse strand (color by COG categories), RNA genes (tRNAs green, rRNAs red, other RNAs black), GC content, GC skew. A. profundus AV18T is the second type strain of the Archaeoglobi with a fully sequenced genome to be published . In contrast to A. fulgidus, the genome of AV18T has a small cryptic plasmid of 2,801 bp that contains four genes which appear to have no other function than the maintenance of this replicative unit. It displays a slightly lower G+C content (40%) than the rest of the genome and is negatively supercoiled, as demonstrated for pGS5 by López-García et al. . The version of the plasmid presented here differs in three positions from the sequence of pGS5, resulting in one split gene. Unlike in bacteria, the archaeal initiation of the replication fork can occur at more than one site (origin of replication, ORI) on the chromosome , which heuristics used for bacteria fail to locate. Likewise, the ORI in A. profundus could not be detected by the use of Ori-Finder (Web Site) , which is consistent with several attempts to discover the replication origin in A. fulgidus by such methods [53-57]. Well-conserved replication signature patterns are known from both Crenarchaea and Euryarchaea . In the genome of A. fulgidus, two almost identical ORB elements of 22 bases length are located at 65.6% of the length of the genome, which is in agreement with the position of the (single) ORI of this organism, identified by experimental origin mapping . Pattern searching in the non-coding regions of the genome sequence of AV18T revealed a situation very much comparable to that of A. fulgidus: Two identical, but inverted ORB elements (TTTCCACAGGAAATAAAGGGGT) were identified between genes Arcpr_1540 and Arcpr_1543; with 1,264 bases of distance (containing two hypothetical proteins) between each other, differing in only two bases from either ORB element in A. fulgidus. This position marks the predicted origin of replication in A. profundus, which is likewise far away from the (single copy of) cdc 6 (generally considered as marker gene for the ORI) Arcpr_0001, located at the very beginning of the chromosome sequence. The presence of further active chromosomal ORIs cannot be excluded, but the strong similarity to the situation in A. fulgidus suggests that the genome of AV18T also contains only one origin of replication. Before the start of the translation process, the recruitment of a ribosome to the mRNA is mediated by a species-specific DNA motif, the Shine-Dalgarno (SD) sequence , constituting the ribosome binding site (RBS) closely upstream of the coding region. In order to identify the SD consensus sequence in A. profundus, the Pattern Discovery Tool (oligo-analysis) of RSAT (Web Site)  was used for de-novo motif discovery within 50 bp regions upstream of all protein-coding genes in the genome of AV18T, with a background model estimated from its whole genome nucleotide sequence. The most frequently detected heptanucleotide was GGAGGTG, matching the complementary sequence one base shifted from the 3'-end of the 16S rRNA: TCTGCGGCTGGATCACCTCCT-3' (bold: matching sequence) is obviously involved in ribosome recruitment. Using Prodoric Virtual Footprint software , the frequencies of heptanucleotides which are able to match (allowing one mismatch) the 3'-end of the 16S rRNA were determined. A significant drop was observed when the seven base window reached the base C at position eleven of the reverse complement 16S rRNA terminus (Table 5), indicating that interactions with the RBS are restricted to the ten most distal bases. Assessment of the frequencies of heptanucleotide sections with one acceptable mismatch in 50 bp regions upstram of all genes in AV18T. In total, the upstream regions of 950 genes match at least one of the four most frequently observed heptanucleotides, representing 51% of all protein-coding genes. Bakke et al. recently evaluated three current genome annotation pipelines on the basis of the Halorhabdus utahensis genome  and recommended the integration of species-specific SD-motifs into the ORF-calling process of automated genome annotation pipelines, in order to determine the correct start codons of protein-coding genes. In several members of the Archaea (group A sensu Torarinsson et al. ), however, the benefits of this approach might be limited by the fact that single genes and first genes of operons are often leaderless (in A. fulgidus: 50%), thus containing no SD sequence . Despite the expected abundance of leaderless transcripts, the percentage of genes preceded by SD sequences is significantly higher than the percentage observed in the genome of H. utahensis  based on the same annotation pipeline: Scanning 50 bp areas upstream of all H. utahensis genes with the most common heptanucleotide (allowing one mismatch) matched in only 8.6% of the respective areas of all genes, while the genome of strain AV18T reached 30.6%. The heptanucleotide matching the very end of the 16S rRNA terminus is slightly less represented than the following shifted motifs, indicating that the final T of the 16S terminus might not be as essential for the RBS recognition as the preceding bases. This is consistent with recent insight into crystal structure and dynamics of the SD helix in an initiation-like 70S ribosome complex of Thermus thermophilus, showing base pairings of positions two to nine from the 3'-end of the 16S rRNA and the SD sequence of the mRNA, excluding an interaction with the very last base of the rRNA . Transferring these results to the analysis of the SD sequence in strain AV18T, the comparatively high observed frequency of motif AGGAGGT is likely due to the setting of the motif scan, which allows one mismatch. The same is true for the opposite side of the SD sequence, and the reason for the high frequency of motif AGGTGAT. Therefore, the predicted complete, species-specific consensus RBS motif of A. profundus is the 8-base pattern GGAGGTGA, which represents the functional sequence area of interaction in the initial contact between ribosome and mRNA in A. profundus. By the use of tRNAscan-SE , a total of 48 tRNAs were identified and the coverage of all possible codons was assessed. Two codons are redundantly represented by tRNAs: AUC (two copies of Ile-tRNA gene) and AUG (four copies of Met-tRNA gene). None of the codons ending on U are are present. Apart from these, AUA is the only codon that is not directly associated with a tRNA. The translation of this codon is strictly dependent on wobble modifications that are carried out by different modification systems in the three domains of life. Insight into the archaeal mechanism of AUG translation was gained very recently , involving the polyamine-conjugated modified base 2-agmatinylcytidine (agm2C) at the wobble position of the corresponding tRNA, and the enzyme tRNAIle-agm2C synthetase (TiaS), which catalyzes the agm2C formation using agmatine and ATP. A candidate for this enzyme in A. profundus AV18T is Arcpr_0572, identified by sequence similarity with the experimentally confirmed TiaS gene in A. fulgidus (AF2259). Arcpr_0572 displays the highest similarity to AF2004, one of three genes belonging to the same gene family in A. fulgidus. Therefore, a bidirectional best BLAST hit to the experimentally confirmed TiaS gene in A. fulgidus cannot be identified in A. profundus. Redundant or missing representation of codons by tRNAs has apparently no effect on the frequency of codon usage (determined by program gp_cusage, Web Site genpak/; data not shown), as both are used in some cases more frequently, in other cases less frequently than the corresponding alternative codon which is allocated exactly one tRNA. The tRNAs for Trp, Tyr and one of the Met-tRNAs contain introns of 60, 17 and 26 bases length, respectively. Concerning the frequencies of the utilized start codons, 84.6% of the protein-coding genes start with AUG, while the frequency of this start codon in A. fulgidus is considerably lower (76.5%). The frequency of the alternative start codon GUG (10.4%) in A. fulgidus is almost twice as high (19.5%), reflecting the difference in GC-content (A. fulgidus: 48.6%), while UUG is rare in both (A. profundus: 4.4%, A. fulgidus: 3.2%). The correct prediction of start codons plays a decisive role in the ORF-calling process. In a comparison between three current genome annotation pipelines, 90% of the predicted genes shared the same stop codons, while only 48% thereof agreed in start codon prediction, resulting in different gene lengths . The average gene length in the genome of AV18T is only 773 bp, while A. fulgidus genes are on average 815 bp long, a difference which – along with the different frequencies of alternative start codons – might also be caused by the different annotation pipelines used for both genomes . The genome sequencing for the type strain of another species of the Archaeoglobaceae, F. placidus AEDII12DOT, provided the opportunity for a genome-wide comparative analysis among three species of the Archaeoglobaceae. All of these analyses were performed using IMG online tools  with the default settings, unless stated otherwise. Metabolic pathways were reconstructed by the combination of online resources such as NCBI (Web Site), KEGG (Web Site , ), BRENDA  and MetaCyc . Orthology of genes was determined by bidirectional best BLAST  hits and the comparison of functional groups using EBI InterProScan . Phylogenetic comparisons are restricted to validly named species only. This limitation excludes e.g. ‘Nanoarchaeum equitans’, ‘Cenarchaeum symbiosum’ and strains assigned to the category Candidatus. The genome size of A. profundus AV18T (1.6 Mb) is significantly smaller than those of A. fulgidus (2.2 Mb, 2,468 protein-coding genes ) and F. placidus (2.2 Mb, 2,622 protein-coding genes). Figure 4 shows the numbers of shared genes in a Venn-diagram. A. fulgidus and F. placidus share a considerable number of genes that are not present in A. profundus. These genes are associated with a wide range of functions and pathways, some of which will be discussed below in more detail. This fraction of genes includes the seven subunits of carbon monoxide dehydrogenase, two of the key enzymes for the β-oxidation of fatty acids, and genes belonging to the CRISPR/Cas system. Venn-diagram depicting the intersections of protein sets (total numbers in parentheses) of the three completely sequenced Archaeoglobi genomes. All intersections concerning A. profundus are gene counts of AV18T, the remaining intersection between A. fulgidus and F. placidus only, are gene counts in A. fulgidus. Due to variable copy numbers of several genes in the three species, the fragments do not add up to the total numbers of genes for A. fulgidus and F. placidus. The genome of strain AV18T contains only a small percentage (8.7%) of paralogous genes, as compared to 12.8% in F. placidus and 17.1% A. fulgidus (Web Site). Likewise, the percentage of genes with signal peptides in strain AV18T (7.4%) is considerably lower than those of A. fulgidus (10.8%) and F. placidus (10.1%. To date, four distinct DNA-dependent DNA-polymerase families are known. They are specifically distributed across the three domains of life, with the unrelated B and D family polymerases being present in Archaea ., The evolutionary divergence further discriminates Crenarchaeota, which have up to three family B monomeric DNA polymerases, and Euryarchaeota, which generally have one monomeric family B DNA polymerase and one heterodimeric family D DNA polymerase . Three different family B DNA polymerases have been detected in Archaea [77-79], B3 being the single family B DNA-polymerase identified in the genome of A. profundus AV18T. The respective gene, Arcpr_0273 is also present in the genomes of A. fulgidus (in contrast to the current annotation, which assigned subtype B1 to this gene) and F. placidus. Each of the three Archaeoglobi contains also one copy of the euryarchaeal family D DNA polymerase, and A. fulgidus is unique by having a second family B DNA polymerase gene (AF0693), belonging to subtype B2. The DNA-dependent RNA polymerase (RNAP) subunit B was previously reported as a suitable tool for phylogenetic reconstructions . A split in the B subunit of the RNA polymerase – resulting in the fragments B' and B'' – has been reported for a subset of the euryarchaeal branch containing the methanogens and halophiles, based on the first five available archaeal sequences of this gene. This split has been described to be phylogenetically conserved and its use for supporting or refuting branching topologies has been suggested . Here, the validity of this observation was reassessed, based on a larger number of available archaeal RNAP subunit B genes (n=77) from all of the currently available fully sequenced genomes. For organisms exhibiting the above mentioned split, the corresponding amino acid sequences of the B' and B'' component were joined and a phylogenetic tree was inferred (Figure 5), showing clusters that are largely consistent with the 16S rRNA tree topology . The topology of this tree suggests a polyphyletic origin of the split in the B subunit, however, the best tree under the constraint of monophyly is not significantly worse (α=0.01) than the tree shown . Therefore, this tree is not significantly in conflict with the assumption of a unique origin of the split into the B' and B'' components of RNAP. Further mapping of the species exhibiting the conserved split against the 16S rRNA phylogeny confirmed the suggestion that this split is the result of a singular event which had taken place in the evolution of the Euryarchaea . The lowest branching family containing this conserved split are Archaeoglobaceae represented by A. profundus, A. fulgidus and F. placidus (genes: Arcpr_0976/7, AF1886/7, Ferp_0762/3). Likewise, all taxa which diverged later from the main branch, i.e. 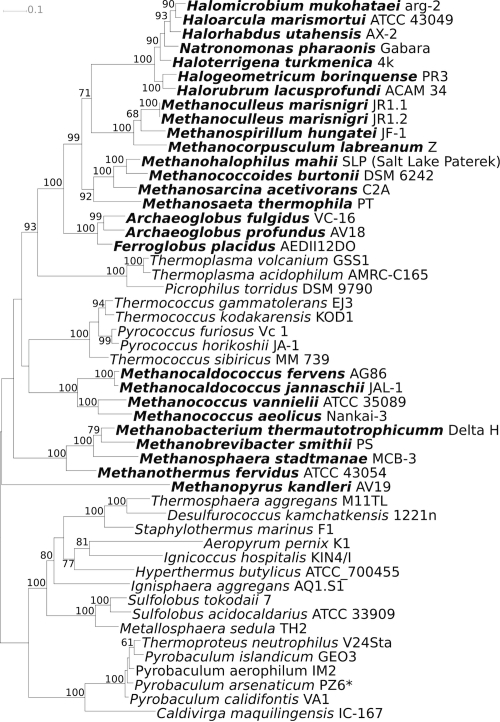 Methanococci, Methanobacteria, Methanomicrobia, Halobacteria and possibly Methanopyrus kandleri (the basal position of the latter in the 16S rRNA-based phylogenetic tree is disputed ), contain this split without exception. Taxa which diverged earlier (Thermococci, Thermoplasmata and all Crenarchaeota) have the unfragmented version of the B subunit, equally without exception among validly named organisms. Phylogenetic tree of archaeal type strains with fully sequenced genomes, inferred using the maximum likelihood criterion , based on an alignment of the RNA polymerase B subunit sequence and rooted with the node which separates Cren- and Euryarchaeota. The alignment was inferred by Muscle  software, using the PROTCATLGF substitution model. Bootstrapping was performed using RAxML  and values above 60% mark the corresponding nodes. Species containing a conserved split in the RNA polymerase B subunit gene are displayed in bold. Clusters of Regularly Interspaced Short Palindromic Repeats (CRISPRs) represent a recently discovered prokaryotic defense system against viral attacks [83,84]. Although frequently observed in members of the Archaea (~90%), A. profundus completely lacks any CRISPRs. In contrast, the genome of A. fulgidus contains three large CRISPR spacer/repeat arrays, consisting of 44 to 60 repeats of lengths between 30 and 37 bases per repeat . Ferroglobus contains twelve CRISPR arrays of variable repeat lengths and copy numbers (JGI, unpublished). A widespread phenomenon among Archaea and Bacteria is their ability to sense environmental conditions by the chemotaxis system and actively move towards more favorable locations by the activity of the flagellum. The archaeal flagella are non-homologous to those of Bacteria, and their components are encoded by one or two well-conserved gene clusters (fla clusters) , which have been subject to extensive phylogenetic studies . A. profundus is reported to be non-motile [1,43], showing no flagellation, in contrast to most Archaeoglobi, including A. fulgidus  and F. placidus . Unexpectedly, the genome sequence revealed the presence of a complete fla gene cluster (Arcpr_1384 – Arcpr_1391) and the preflagellin peptidase FlaK gene (Arcpr_0277), . The situation in A. fulgidus (AF_1048–AF_1055, flaK-gene: AF_0936) and F. placidus (Ferp_1456–Ferp_1463, flaK-gene: Ferp_0061) is virtually identical in content, order and orientation of genes of the fla cluster, therefore the different phenotypes are unexpected. However, a conflict between presence of the flagella genes and the phenotypically observed lack of motility is not unique for A. profundus, but has also been reported for Methanosarcina species . Also the reverse, even more surprising case – observed motility, but lacking homologues of the genes coding for flagellum components – has been reported for Pyrobaculum aerophilum and M. kandleri . Some of our electron micrograph images (data not shown) displayed structures which might be flagella on few A. profundus cells, mainly observed in larger cell clots. This indicates that A. profundus might be flagellated under certain conditions, not necessarily for motility reasons, but also functions such as cell-cell adhesion to form cell aggregates (as reported for Methanosarcinales) are thinkable. In any case, the possibility of artifacts (e.g. the presence of fragments from damaged cells) causing the observed structures on our electron micrographs cannot be excluded. Unlike the flagellum genes, the archaeal chemotaxis system is homologous to the one in bacteria (for a review see ). Using the IMG Phylogenetic Profiler, the genomes of A. profundus, A. fulgidus and F. placidus revealed the same genetic components for a chemotaxis system (AF1034, AF1037–AF1042, AF1044; Arcpr_1371–Arcpr_1376, Arcpr_1378, Arcpr_1379; Ferp_1072–Ferp_1377, Ferp_1379, Ferp_1990), with the only exception that A. fulgidus displays two copies of the methyl-accepting chemotaxis protein, while the others only have one. This observation again supports the hypothesis that A. profundus might be motile under certain conditions, otherwise not only its flagellum-genes, but also the genetic components for chemotaxis would remain unused. However, the archaeal system of motility and chemotaxis is not yet fully unraveled. Especially the proteins constituting the flagellar motor and the link between chemotactic signal transduction and the motility apparatus . The lack of undescribed essential components for this complex cannot be ruled out for A. profundus, which might be the reason for the observed immobility. In the first description of A. profundus, minor growth on acetate containing crude oil was observed . With the here reported complete genome sequence, it becomes clear that this organism is unique within its sequenced relatives in lacking two of the four key enzymes for β-oxidation: 3-hydroxyacetyl-CoA-dehydrogenase (EC:1.1.1.35) and enoyl-CoA-hydratase (EC:4.2.1.17). Therefore it can now be posited that the reported growth on crude oil was most likely due to the contained traces of acetate, as the organism lacks essential components required for the oxidation of long-chain fatty acids via β-oxidation. Currently, F. placidus is the only validly named member of the Archaeoglobi which has been shown to be able to use nitrate as electron acceptor. A cluster of genes encoding a putative nitrate reductase has yet been identified in A. fulgidus (AF0173–AF0176) and discussed in the literature [34,91], again resulting in a conflict between genetic equipment and observed metabolic features, as a biochemical evidence for nitrate reduction is still missing in A. fulgidus. Homologues of these genes are also present in A. profundus, though distributed in two separate locations in the genome (Arcpr0672, Arcpr0674, Arcpr1727, Arcpr1728) and in F. placidus (Ferp_0121-Ferp_0124). The latter contains another nitrate reductase gene cluster (Ferp_0311–Ferp_0314, additional gamma subunit: Ferp_1088), which might be the reason for the observed nitrate respiration in culture conditions, while specificity and activity of the more widely distributed hypothetical nitrate reductase gene cluster remains subject to further experiments. The reduction of sulfurous compounds is the central electron accepting pathway in the metabolism of A. profundus. The genetic equipment for the catalysis of the corresponding reactions is largely equivalent to the one previously described for Desulfovibrio species and postulated for Desulfohalobium retbaense . The respective genes of A. profundus have been determined by sequence comparisons and identification of the corresponding functional groups. A notable difference to the mechanism of sulfate-reduction in Desulfovibrio species is the absence of a periplasmic cytochrome buffer composed of cytochrome c3. Thus, genes encoding a molybdopterin oxidoreductase MOP complex – as described for Desulfovibrio desulfuricans G20  – have not been identified in the genome of A. profundus. The MOP complex is thought to transfer electrons to menaquinone by interacting with periplasmic reduced cytochrome c3. The regeneration of the reduced menaquinone pool is most likely performed by a set of F420-nonreducing hydrogenase family proteins (genes: Arcpr_1002, Arcpr_1005 and Arcpr_1006) which transfer electrons originating from the oxidation of hydrogen – via a co-localized gene (Arcpr_1004) encoding a membrane associated cytochrome b – to oxidized menaquinone molecules in the membrane. Another option for the reduction of the menaquinone pool is given by a F420H2:quinone oxidoreductase complex, utilizing electrons supplied by F420H2. 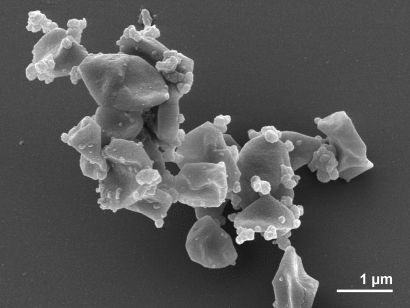 This reduced electron carrier originates from the pathway of reverse methanogenesis, which is a typical feature of the Archaeoglobi. The F420H2:quinone oxidoreductase complex has been studied in A. fulgidus [94,95] and a similar gene cluster exists in A. profundus (Arcpr_1575–Arcpr_1584). One of three additional proteins which have been found in the purified complex of A. fulgidus  has also been identified in A. profundus (Arcpr_0247) by reciprocal BLAST search. The quinone-interacting membrane-bound oxidoreductase (QMO)-complex (Arcpr_0661–Arcpr_0663) transfers electrons via the heterodimeric AprAB complex (Arcpr_1261, Arcpr_1262) from the reduced menaquinone pool in the membrane to activated sulfate (APS, adenosine-5'-phosphosulfate), forming sulfite. Likewise, the membrane-associated DsrMKJOP (Arcpr_1727–Arcpr_1731) complex transfers electrons from the same source to the dissimilatory sulfite reductase (Arcpr_0139-Arcpr_0141), catalyzing the reduction from sulfite to sulfide. Both processes are used to generate a membrane potential with the major purpose of ATP production. The enzymatic equipment used for reverse methanogenesis in A. fulgidus is equivalent to the the “Eastern branch” of the Wood-Ljungdahl pathway, which is also present in acetogenic organisms . This pathway consists of two branches, each reducing a CO2 into a methyl- and a carbonyl-moiety, respectively, which are joined forming acetyl-CoA. This metabolic capacity is not present in A. profundus, due to a blocked “Western branch” (acetyl-CoA decarbonylase/synthase is absent), a fact which has been discovered already in 1995 . The consequence for A. profundus is its inability to grow autotrophically [43,97]. In both A. fulgidus and F. placidus, all genes for the complete set of seven different subunits of the acetyl-CoA decarbonylase/synthase are present and both can grow autotrophically, like all other described Archaeoglobaceae, except A. profundus and A. infectus. However, A. profundus might be able to use the presence of the Eastern branch of the Wood-Ljungdahl pathway for a certain amount of CO2-fixation, as the intermediate 5,10-methylene-tetrahydro-methanopterine can be branched off to other pathways, e. g. by formaldehyde-activating enzyme (Arcpr_1052) into formaldehyde, or by glycine hydroxymethyltransferase (Arcpr_0687, Arcpr_1587) to the glycine, serine and threonine metabolism. Besides providing comprehensive insight into the genetic equipment, the completely sequenced genome of A. profundus revealed instances in which the presence of certain genes suggests capabilities which were not observed in laboratory cultivation, such as flagellation or chemotaxis. Reasons for this might be paralogous genes, e. g. having altered, yet unidentified substrate specificity, defect genes, pseudogenes or genes which are permanently transcriptionally deactivated, as reported for hydrogenase genes in Methanosarcina acetivorans . Alternatively, the biochemic capacities might only be exhibited under specific unknown environmental conditions, which are yet to be reproduced in laboratory experiments. We would like to gratefully acknowledge the help of Jörn Petersen (DSMZ) for retrieving information concerning the cryptic plasmid of A. profundus. This work was performed under the auspices of the US Department of Energy Office of Science, Biological and Environmental Research Program, and by the University of California, Lawrence Berkeley National Laboratory under contract No. DE-AC02-05CH11231, Lawrence Livermore National Laboratory under Contract No. DE-AC52-07NA27344, Los Alamos National Laboratory under contract No. DE-AC02-06NA25396, and UT-Battelle Oak Ridge National Laboratory under contract DE-AC05-00OR22725, as well as German Research Foundation (DFG) INST 599/1-2. Garrity GM, Holt JG. Phylum AII. Euryarchaeota phy. nov. In: Bergey's Manual of Systematic Bacteriology, vol. 1. 2nd ed. Edited by: Garrity GM, Boone DR, Castenholz RW. Springer, New York; 2001; pp 211-355. Garrity GM, Holt JG. Class VI. Archaeoglobi class. nov. In: Bergey's Manual of Systematic Bacteriology, vol. 1. The Archaea and the deeply branching and phototrophic Bacteria. Springer, New York; 2001; pp 349. Huber H, Stetter KO. Order I. Archaeoglobales ord. nov. In: Bergey's Manual of Systematic Bacteriology, second edition vol. The Archaea and the deeply branching and phototrophic Bacteria. Springer, New York; 2001; pp 349. Hartzell P, Reed DW. The genus Archaeoglobus In: Falkow S, Rosenberg E, Schleifer K-H, Stackebrandt E. (eds. ), Prokaryotes, Third Edition, Springer, New York 2006; 3:82-100. Stetter KO, Huber R. The role of hyperthermophilic prokaryotes in oil fields. In: Bell CR, Brylinsky M, Johnson-Green P (eds. ), Microbial Biosystems: New Frontiers: Proceedings of the 8th International Symposium on Microbial Ecology, Atlantic Canada Society for Microbial Ecology, Halifax, Canada 2000, pp. 369-375. Huber H, Stetter KO. Family I. Archaeoglobaceae fam. nov. In: Bergey's Manual of Systematic Bacteriology, second edition vol. The Archaea and the deeply branching and phototrophic Bacteria Springer, New York; 2001; pp 349.